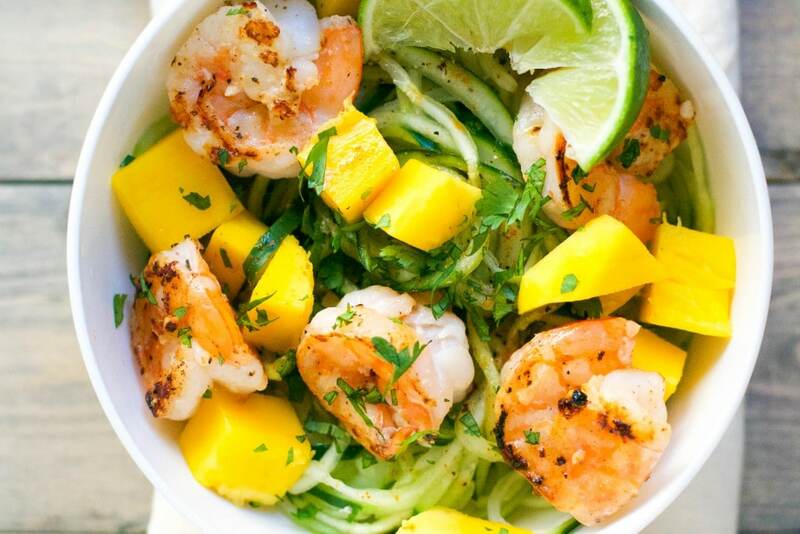 Mango and Shrimp Cucumber Noodles are light, healthy and so delicious! Gluten-free and dairy-free, this meal is even great for a Whole 30 diet! It’s getting so warm here in Chicago! Finally some sunny days here! I love running out of the house without a jacket on and not having to worry if it will be snowing or below zero degrees. Who am I kidding.. it’s Chicago. It can be 80 and sunny and then snow in the same day. And then hail. And rain. And then be sunny again. But I’m loving the warm weather. When it’s this warm out, I try not to use the oven as much as I can. Old apartments with window unit air conditioners don’t exactly stay cool this time of year. 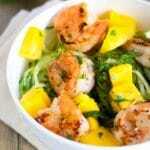 But this mango and shrimp cucumber noodles recipe is my absolute favorite. I love using shrimp as a protein since they are super quick to cook in the skillet. Just a few minutes on each side and they’re done. Beyond that, it’s honestly just spiralizing a few cucumbers, cutting up a mango and adding some fresh herbs and spices. Boom. Dinner done! 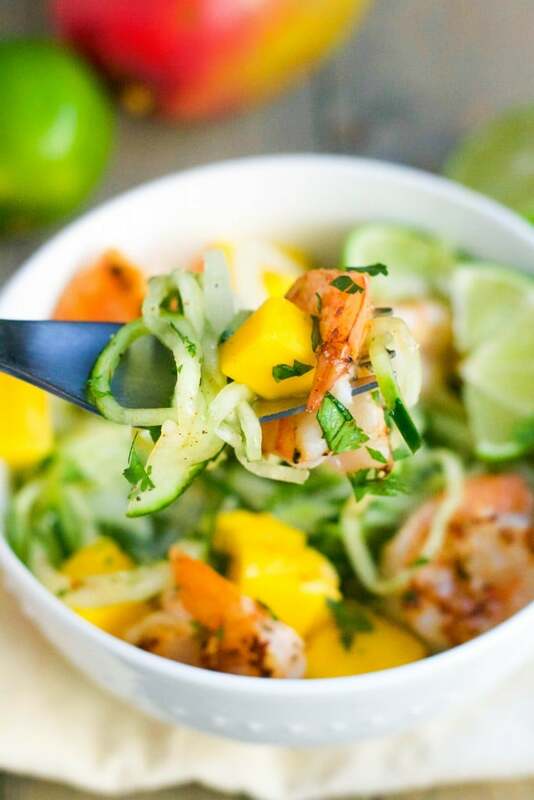 The cucumber noodles are just so refreshing and work so well with the zesty lime juice and sweet mango. I love to add a pinch of cayenne pepper to the top for a little kick! I can’t wait to make more variations of this recipe this summer! Who says the spiralizer is just for zucchini? 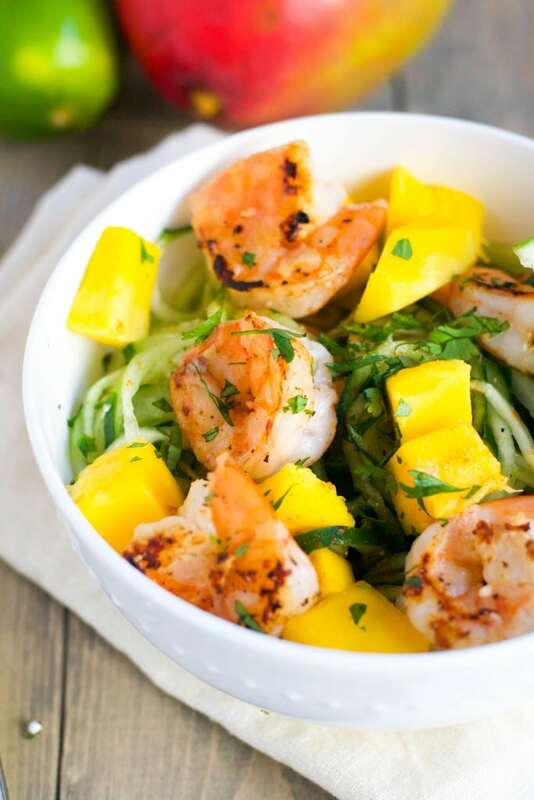 Spiralize cucumbers in this shrimp mango cucumber noodles recipe. It only takes 15 minutes to make and it's popping with flavor! Gluten-free and dairy-free. Season shrimp with salt and pepper. Preheat oil in a skillet over medium high heat. Add the shrimp and minced garlic to the pan and cook for 2-3 minutes on each side, until the shrimp is pink. Set aside. 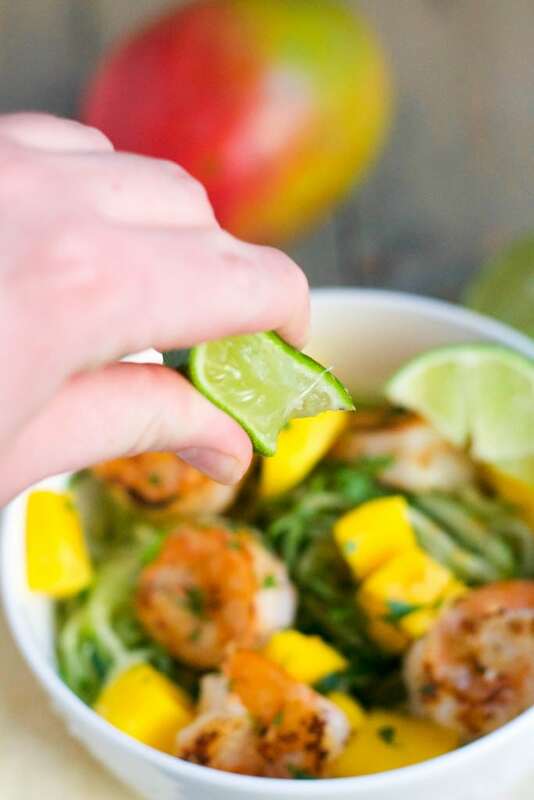 While the shrimp is cooking, cut the cucumber into long strips using a spiralizer or you can attempt to use a vegetable peeler. 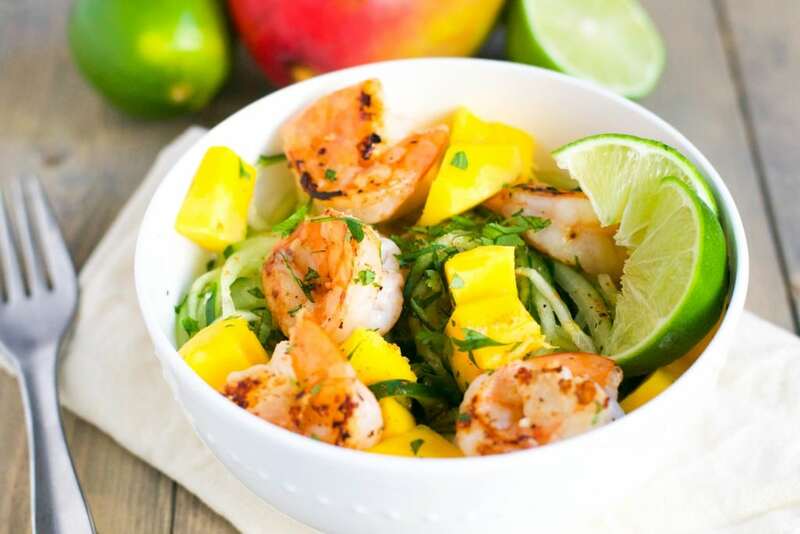 Toss the cucumber with the cooked shrimp, fresh lime juice, cilantro, and diced mango. Garnish each dish with a pinch of cayenne pepper. I use this vegetable spiralizer.